Our 32,000 employees make a difference every day in the lives of our customers. Our uncompromising values – safety first, unquestionable trust, superior performance and total commitment – are key to our sustained success by guiding our behavior and ensuring we put the needs of those we serve at the center of all we do. As you may remember from Southern Company’s 2016 summary annual report, goal setting is a major part of Khadijah Digg’s life. As a senior project manager for Southern Company Services, Khadijah sets goals to achieve success on major projects. But her ability to hit milestones doesn’t stop at work. Khadijah, a Team USA triathlete, trains vigorously to not only reach her physical goals, but exceed them as she competes around the world. 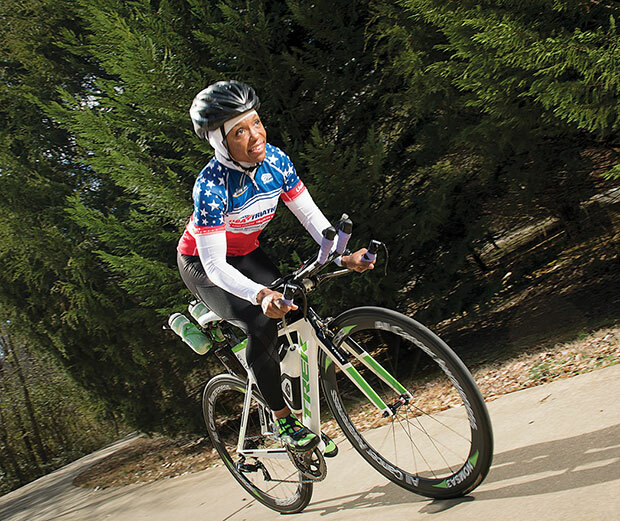 Khadijah’s journey as a triathlete began in 2012 when she competed in her first triathlon, the Iron Girl Triathlon at Lake Lanier Islands, Ga. Despite coming in third to last place, Khadijah felt invigorated. It was at that moment she set her most ambitious goal yet: join Team USA. Fast forward five years and Khadijah is preparing to compete with Team USA in the Long Course Triathlon World Championships. Khadijah chronicles her journey as a triathlete on her Facebook page, Trigammalete. In authentic photos and videos, she shows the glamourous and not so glamourous side of training. Khadijah’s motivation and passion is contagious. As a mom, a professional, and a competing triathlete, she continues to push her limits for herself, her family and everyone she inspires. And what an inspiration she is. Khadijah is the first African American woman to represent Team USA in Long Course Triathlon and the first Muslim woman to represent Team USA in any multi-sport event. She uses her platform as an athlete to promote a positive image of Muslim women and Islam in general. Khadijah heads to British Columbia, Canada on Aug. 27 where she will compete with Team USA in the Triathlon World Championships. She has pushed her limits in training and intends to cross the finish line with everything she’s got. Join us as we wish Khadijah good luck as she represents Southern Company and our country on the world stage. "Southern Company invests so much in students, and, in turn, we really invest a lot back." When Yasmeen Arafeh and Katie Sheibley first met on a study abroad trip in 2015, they didn’t expect to cross paths again. 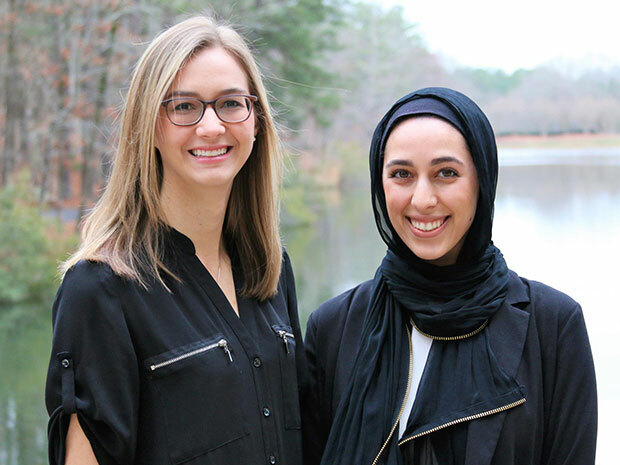 But Katie and Yasmeen’s paths would cross just a short year later at Southern Nuclear Company (SNC) in Birmingham. Katie, an engineer in Environmental Affairs at SNC, joined Southern Company as a co-op student in 2013 and was hired full-time in 2016. She first heard about the Southern Company co-op program at the University of Alabama at Birmingham (UAB), where she studied civil engineering. Yasmeen was only a few years behind Katie in school and, like Katie, was a UAB student studying civil engineering. Yasmeen knew the Southern Company co-op program was highly sought after and she was motivated to do well in school so she could qualify for the program. Yasmeen’s hard work paid off when, in 2016, she began her co-op assignment at SNC, where she was placed on the same team as Katie. Katie and Yasmeen now work side-by-side on a tight-knit team in new nuclear development. Katie is able to guide Yasmeen through the ins and outs of the co-op experience because she once was in the same position. This unique bond has led to an inspiring mentor-mentee relationship filled with understanding and encouragement. Recently, Yasmeen received UAB’s Outstanding Undergraduate Engineer of the Year award, an achievement Katie also received as a student. Yasmeen has one more rotation in her co-op program, which she will fulfill this fall. After graduation, she hopes to continue on the same path as Katie. Yasmeen and Katie are both thankful for the experience the co-op program afforded them. Their challenge to other students is to strive for excellence. “Set goals and have a questioning attitude so you are continuously learning. These things combined will set you up for success in the workforce." Meet Sloane Evans. Vice President of Human Resources for Georgia Power. 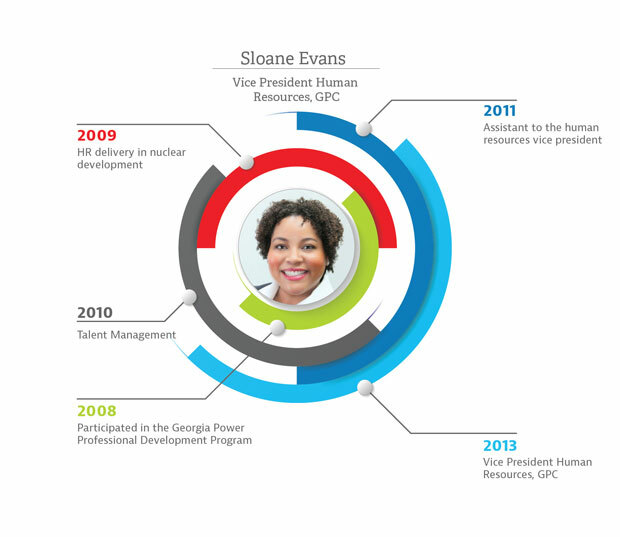 Sloane Evans is vice president of human resources for Georgia Power. Her primary areas of responsibility are the Georgia Power health and wellness, talent management, labor relations and HR delivery organizations. Evans is also a member of the Georgia Power Management Council. Evans graduated from the University of Georgia with a bachelor’s degree in psychology. Active in her community, Evans serves on the board of directors for Boy Scouts of America, Habitat for Humanity in Atlanta, Technical College System of Georgia, and Georgia Public Telecommunications Commission.